The number of Canadian enterprises exporting goods abroad rose by 191 firms in 2017 to 43,480. This change mainly reflected an increase in the number of exporting enterprises in the manufacturing sector. That strength was largely offset by a decline in the retail trade sector. Canadian enterprises exported $483.6 billion worth of goods in 2017, up $30.0 billion from 2016. Small and medium enterprises accounted for 54.4% of the increase, mainly from firms in the energy sector. Large enterprises still accounted for 2.6% of all exporters in 2017, but were responsible for 58.1% of all export values. These firms are more likely to export to non-US countries than small and medium enterprises. Exporter characteristics can also be analyzed on an establishment basis. The establishment better reflects the primary industrial activity and the province of the exporter. One enterprise can have multiple establishments operating in different provinces and industries. The most significant increase in export values in 2017 was in the mining, quarrying, and oil and gas extraction industry, up $19.4 billion in 2017 to $70.9 billion, following two consecutive annual declines. 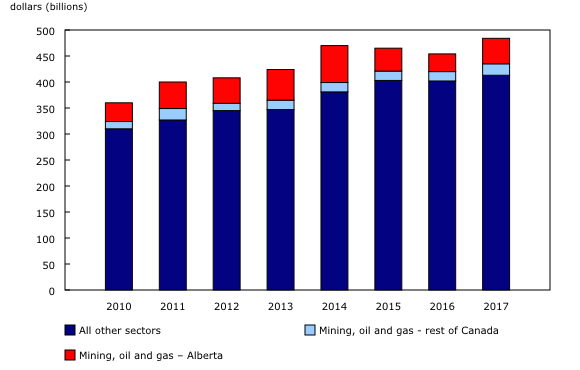 Establishments from Alberta accounted for three-quarters of this gain, due to higher crude oil prices and increased export volumes. Other sectors contributing to the rise in export values were wholesale trade (+$7.4 billion) and, to a lesser extent, manufacturing (+$2.2 billion). The increase in manufacturing was led by primary metal and petroleum and coal products. This increase was partially offset by a decline in transportation equipment. The number of importing enterprises greatly exceeded that of exporting enterprises for all of Canada's major trading partners from 2010 to 2017. In 2017, 154,225 enterprises imported goods from abroad, with 113,517 importing from the United States. This was over three times the number of enterprises exporting goods to the United States. Likewise, there were more enterprises importing from major partners such as China, Germany, Mexico and the United Kingdom than exporting to these countries. Of all the enterprises that traded goods in 2017, 29,349 were both importers and exporters. 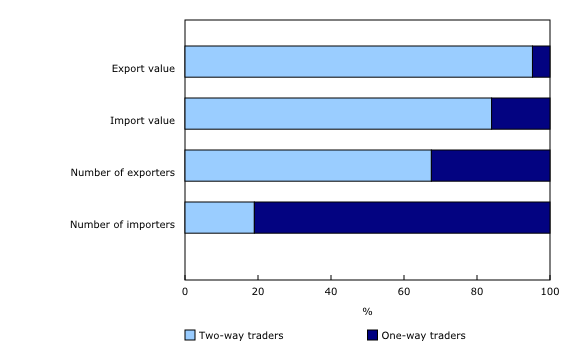 These two-way traders were responsible for most of Canada's export (95.2%) and import (84.0%) values, reflecting the importance of these firms in the global value chain. Enterprises that engaged in exports are also more likely to import goods than importers are likely to export goods. In 2017, 67.5% of all exporters were also engaged in import activities, while 19.0% of importers were engaged in exporting activities. The Trade by Exporter Characteristics: Goods program is an initiative at Statistics Canada undertaken to analyze the business characteristics of exporters in Canada. These estimates are formed by linking customs trade data records to business entities in Statistics Canada's Business Register. Data on exports to the United States are collected by the US Census Bureau and transmitted to Statistics Canada as part of the Canada–US data exchange, while data on exports to the rest of the world are collected jointly by Statistics Canada and the Canada Border Services Agency. The Business Register contains the complete operating and legal structure of enterprises operating in Canada, as well as their key characteristics such as employment and North American Industry Classification System code. This release contains information at both the enterprise and establishment levels. An enterprise is defined as the statistical unit that directs and controls the allocation of resources relating to its domestic operations, and for which consolidated financial statements are maintained. An establishment is defined as the statistical unit where the accounting data required to measure production are available. The two measures generate a different number of exporting units as well as a different industry allocation of these units. Small and medium-sized enterprises have fewer than 500 employees, including those that did not report any employment. Large enterprises have 500 or more employees. Detailed information on concepts and methodology relating to this release is available on the Trade by Exporter Characteristics: Goods survey page. This release also refers to imports. Detailed information on concepts and methodology relating to imports is available on the Trade by Importer Characteristics: Goods survey page. In this release, the total value of exports refers to the part of the annual domestic export value (customs basis) that can be linked to specific entities in the Business Register each year. Annual domestic export values (customs basis) can be obtained from CANSIM table 228-0060. Additional information and definitions related to domestic merchandise exports are available on the survey page for Canadian International Merchandise Trade (customs basis). Each year from 2010 to 2017, the total number of identified exporting enterprises accounted for 96% to 98% of the total domestic export value. Throughout this release, the percentage share of export sales corresponds to the share of the annual domestic export value for which there was an identified exporter. 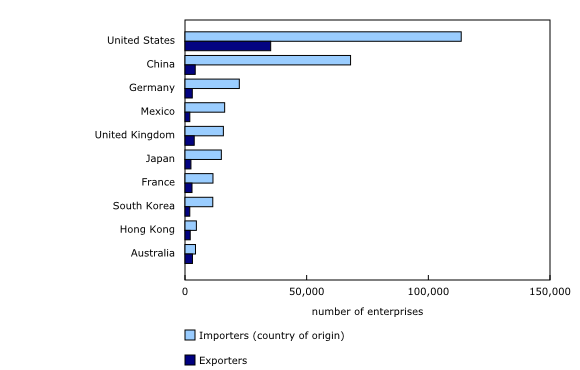 The number of exporters corresponds to the number of exporters identified within the Business Register by the Trade by Exporter Characteristics: Goods program. To enquire about the concepts, methods or data quality of this release, contact Angela Yuan-Wu (613-240-2871; Angela.YuanWu@Canada.ca) or Adam Gadawski (613-698-5897; AdamMcDowell.Gadawski@Canada.ca), International Accounts and Trade Division.